Recombinant fragment, corresponding to amino acids 489-773 of Human CPT1A. 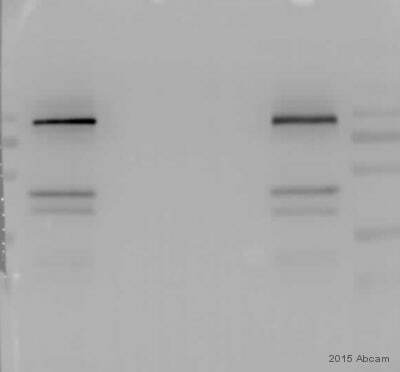 This monoclonal antibody to CPT1A has been knockout validated in Western blot. The expected band for CPT1A was observed in wild type cells and the band was not seen in CPT1A knockout cells. Purity is near homogeneity as judged by SDS-PAGE. The antibody was produced in vitro using hybridomas grown in serum-free medium, and then concentrated by ammonium sulfate precipitation. Our Abpromise guarantee covers the use of ab128568 in the following tested applications. IHC-P Use a concentration of 0.5 µg/ml. Perform heat mediated antigen retrieval with citrate buffer pH 6 before commencing with IHC staining protocol. WB Use a concentration of 1 µg/ml. Predicted molecular weight: 88 kDa. ICC/IF Use a concentration of 0.5 - 5 µg/ml. In-Cell ELISA Use a concentration of 0.1 - 1 µg/ml. Strong expression in kidney and heart, and lower in liver and skeletal muscle. Lipid metabolism; fatty acid beta-oxidation. Defects in CPT1A are the cause of carnitine palmitoyltransferase 1A deficiency (CPT1AD) [MIM:255120]; also known as CPT-I deficiency or CPT1A deficiency. CPT1AD is a rare autosomal recessive metabolic disorder of long-chain fatty acid oxidation characterized by severe episodes of hypoketotic hypoglycemia usually occurring after fasting or illness. Onset is in infancy or early childhood. Belongs to the carnitine/choline acetyltransferase family. Lanes 1 - 4: Merged signal (red and green). Green - ab128568 observed at 88 kDa. Red - loading control, ab181602, observed at 37 kDa. ab128568 specifically detected the expected band for CPT1A in wild-type HAP1 cells. No band was observed in CPT1A knockout cells. Wild-type and CPT1A knockout samples were subjected to SDS-PAGE. ab128568 and ab181602 (loading control to GAPDH) were diluted at 1 μg/mL and 1/10000 respectively and incubated overnight at 4°C. Blots were developed with Goat anti-Mouse IgG H&L (IRDye® 800CW) preadsorbed (ab216772) and Goat Anti-Rabbit IgG H&L (IRDye® 680RD) preadsorbed (ab216777) secondary antibodies at 1/10000 dilution for 1 hour at room temperature before imaging. Immunofluorescent staining of CPT1A in H9C2 cells (rat) using ab128568. Primary antibodies: Anti-CPT1A antibody (ab128568) 0.5 ug/mL 1x Sigma Block with 0.1% Triton X-100 incubated overnight at 4 °C. Washing: 3x 1% NGS 10 minutes/wash. Secondary antibodies: Alexa 488 GAM 1:1000 diluted in 1% NGS with 0.1% Triton X-100 PBS incubated for 2 hours at room temperature while rocking. 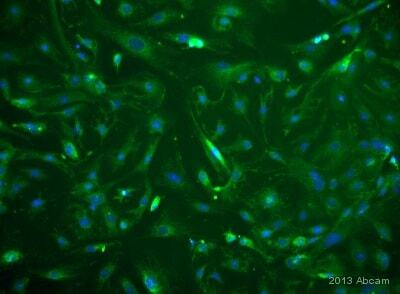 DAPI: 20 ng/mL in 1% NGS, 0.1% Triton X-100 PBS. Washing: 1x 1% NGS 10 minutes/wash. IHC image of CPT1A staining in human normal kidney formalin fixed paraffin embedded tissue section, performed on a Leica BondTM system using the standard protocol F. The section was pre-treated using heat mediated antigen retrieval with sodium citrate buffer (pH6, epitope retrieval solution 1) for 20 mins. The section was then incubated with ab128568, 0.5µg/ml, for 15 mins at room temperature and detected using an HRP conjugated compact polymer system. DAB was used as the chromogen. The section was then counterstained with haematoxylin and mounted with DPX. Overlay histogram showing HeLa cells stained with ab128568 (red line) or no primary antibody (black line). The cells were fixed with 4% paraformaldehyde (15 min) and then permeabilized with 0.1% Triton X-100 in PBS, 3% BSA for 10 min. The cells were then incubated in 3% BSA in PBS for 10 minutes to block non-specific protein-protein interactions followed by the antibody (ab128568, 1µg/mL) for 60 min at 22ºC. The secondary antibody used was DyLight® 488 goat anti-mouse IgG (H+L) (ab96871) at 1/1000 dilution for 30 min. Seeding: HeLa cells seeded in a 1:2 dilution series starting at 60,000 cells/well across Row A, 30,000 cells/well across Row B, etc. Row H contains no cells. Table: Example In-Cell ELISA Average Data from shown plate. Primary antibodies: All primaries diluted in 1x Sigma Block with 0.3% Triton X-100 incubated overnight at 4 °C. Publishing research using ab128568? Please let us know so that we can cite the reference in this datasheet.